Exclusive blend of tryptophane and herbs that soothes and relaxes horses for training and competition. Requires approximately 4 hours to have full effect. Contains valerian root. All natural so no perscription is required. Cellarator Turbo by Loomix is 3-in-1 paste combines the blood cell building technology of Cellerator X with direct-fed microbials and electrolytes. Oral hyaluronic acid joint supplement for horses. 6 dose syringe. Electramino Paste is an electrolyte paste for use in athletic horses to help replenish electrolytes lost during times of diarrhea, stress, sweating, or hard exercise. 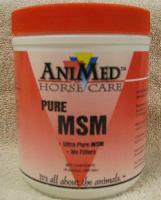 A nutritionally complete powder that is reconstituted with water for feeding orphaned or early weaned foals. 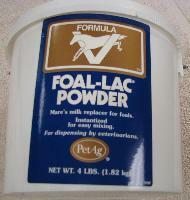 Formulated specifically for foals; simulates the nutritional composition of mare's milk. A feed supplement for use in horses. 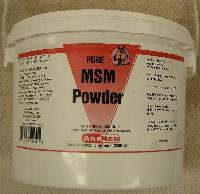 MSM is a bio-available source of dietary sulfur to aid in the synthesis of collagen, which promotes joint, cartilage and skin health. A palatable yucca-flavored vitamin-iron-mineral liquid feed supplement for horses. Apple flavored nutritional suppliment for bones and joints. Contains 120 scoops per jar. 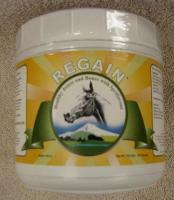 Feed 2 scoops daily for initial 4 to 6 weeks then 1 to 2 scoops daily depending on your horse's needs.